Fox is out Foxed by Chickens. Hi there keepers, while chatting on the phone with my Mother in the UK other day, she alerted me to a story that broke a few months ago in the UK, now I normally don’t copy and paste, I write all the contents on here myself, but on this occasion I thought i’d share two articles from two very different UK newspapers with you. first this is from the Guardian, a broadsheet newspaper. Mrs Cordell, who lives in Langdon Hills, Essex, with her partner Gary Howell, 45, said foxes had often broken into the coup and killed their chickens in the past. She said she had shut up the sliding door of the shed on Friday night when she put the chickens to bed but thinks the fox must have nosed its way under the door. 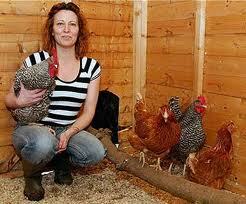 When she went out the next morning the door was still shut but the fox was trapped inside with the birds. A GANG of four plucky chickens hatched a murderous plan to take revenge on a fox terrorising their coop — and pecked him to death. I hope you enjoyed both accounts. Hi there folks, while at the cemetry in Southend, I got talking to a lady about plants that rabbits wouldn’t eat, as the cemetry is overrun with rabbits, and most flowers that the loving families place on the graves, are demolished the very same night, so I put a small spikey succulent type plant on my fathers grave to deter the little furry critters. I noticed the grave the lady was tending was in full bloom, several flowering plants, so I asked her how she stopped the rabbits from eating them, ‘ Dog hair’ she said, she combs hair from her sisters greyhounds and places it around the area of the grave and plants, she reckons the rabbits smell the dog hair and believe it could still be close so they go and eat someone else’s plants. Maybe this theory can be transferred to other predators, i.e essence of cat to keep vermin away, essense of foxhound etc etc. Maybe these products are already on the market somewhere, please let me know if you know of any. I’m am faced with a tricky one when it comes to the swamp hens, as if it repells them it may repell the girls too, maybe a visual deterant might be better, like a cut out of a cat in the garden, a scarecat mounted on a spring to give it movement. I raced out this morning apon hearing one of the girls doing her best alarm call yet, not to find Pukeko’s raiding the nest or rats stealing their food, but all the noise was to alert me to the fact that the chicks were out roaming the garden, Nancy the ‘ Boss’ was most upset that the chicks were in HER garden, was wasn’t happy until i had put them back into the brooder, infact she wasn’t happy then either as she stood infront of the brooder reading out more of the riot act to the chicks, until some feed was produced and she forgot all about it.